Biostar continues to flesh out its recently introduced Racing line of motheboards that take aim at gamers on a budget. 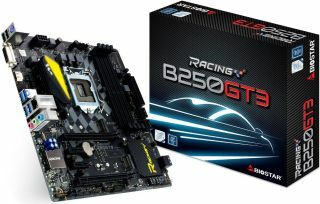 Its newest additions are a couple of boards based on Intel's B250 chipset with compatibility for the company's Kaby Lake (and Skylake) processors, the Biostar Racing B250GT3 and B250GT5. The B250GT3 is the cheaper of the two with an MSRP of just $79. It's a micro-ATX board with four DDR4 memory slots supporting up to 64GB of 2400MHz RAM, along with two PCI-E x16 3.0 slots (x16, x4) and two PCI-E x1 3.0 slots. For storage duties, there are half a dozen SATA 6Gbps connectors, plus an M.2 32Gb/s connector with Intel Optane memory support and an M.2 connector supporting SATA 6Gbps and PCIe storage. External connectivity consists of four USB 3.0 ports and two USB 2.0 ports. Users will also find a USB 3.0 header and two USB 2.0 headers. GbE LAN and onboard 8-channel audio round out the list of core features. Biostar's B250GT5 board is a little pricier at $109. It's a full ATX board and adds two old-school PCI slots to the mix. It also trades one of the USB 3.0 Type-A ports for a USB 3.0 Type-C (still 5Gbps), which is the other distinguishing feature between this and the B250GT3. Both motherboards share certain amenities with higher priced offerings, such as dual BIOSes, 100 percent solid capacitors, anti-surge protection, and hi-fi components for clean sounding audio. If the checkered flag decor isn't enough bling, the boards also come with two 5050 LED headers. You can customize the lighting scheme through Biostar's Racing utility. Biostar did not say when its new boards will be available, but it will likely be within the next month.